Seva Electronic Dip system is nothing but we can select the seva on on-line electronic dip system, the following is the images to find it simple. Plz follow this images how to do it..
First Login to the site www.ttdsevaonline.com. Then check " I have read and agree to the instruction and click "Continue". Then the screen appear like this. Here we can add another person along with yourself, Her name,age,aadhar card number and click "continue" and it will appear like this. Here we can select any one option in it. 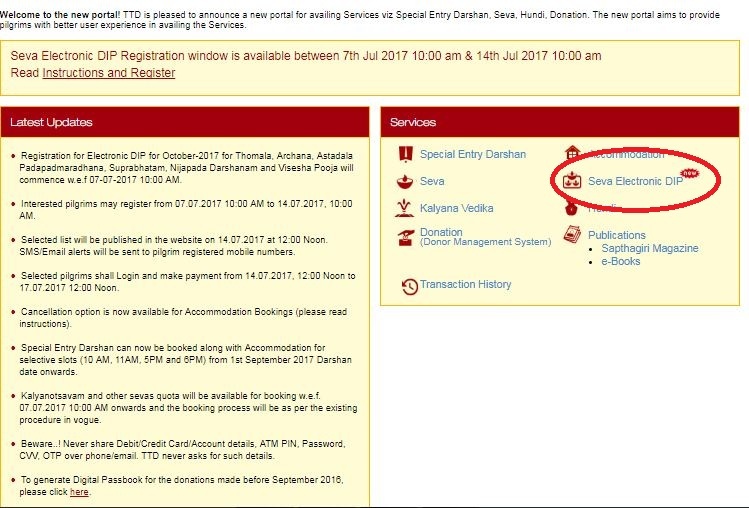 Ist option is "Any Seva Any Day" or we can select "Select seva date" for particular seva for the day. And check available in the calendar over there in this pic. And select the date and the seva as well and click continue. And it appear like this..
For further details contract our call center : 0877-2277777,2233333. Thanks for sharing the details. It was useful. When is the eDIP portal opened for booking? is there any specific date/day? Every month 1st friday it going to open the quota. This Dec 2017 at 1st, the total month of march 2018 quota will opened for booking. Do we need to submit payment during booking Process? Can I select all dates ? we are 8 members in our family, how can i apply?? can i apply all members in one account?? 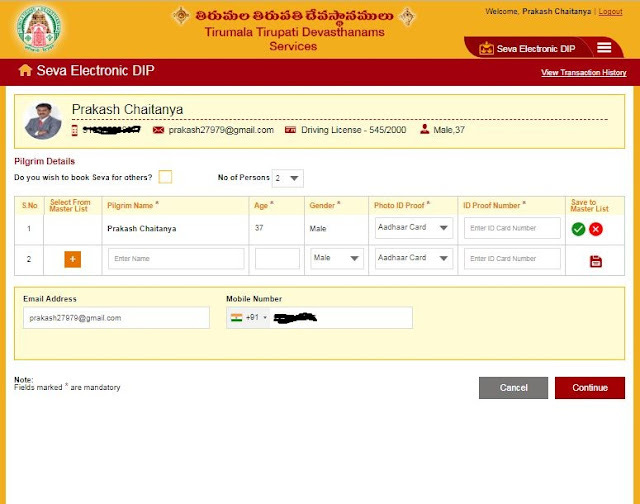 How many tickets are issued in Seva electronic dip every month? What is done in Archana in Seva electronic dip? Is it a nice seva? Like ... will we get enough time to see the Lord or unlike anyother will they just push us off?? 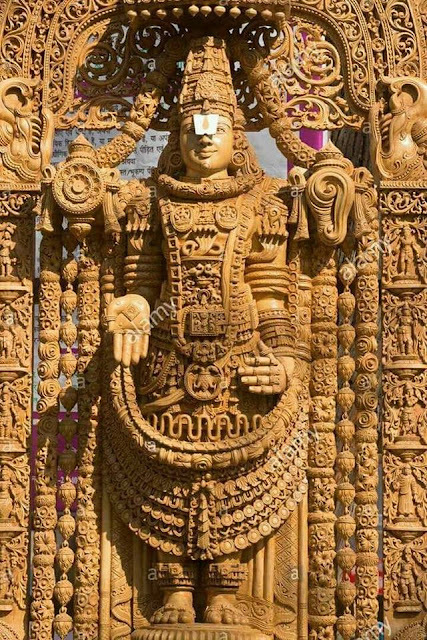 Archana to the main deity Lord Venkateswara is performed amidst chanting of one thousand name of the Lord. This occurs immediately after 'Suprabhatam' and Thomala seva. Devotees who have bought tickets for this Archana can take part in the seva. The archakas offer tulasi leaves sent by the Jeeyangar to the Lotus Feet of the Lord while one thousand names are being chanted. Later, the tulasi leaves kept on the Lord's Feet are placed at the Lotus Feet of Maha Lakshmi seated in his chest amidst chanting of 'Mahalakshmi Chaturvimsati' (24 names of the Goddess). The ritual lasts for 30 minutes. The Lord also receives second and third archanas later in the day. However, these are done in 'ekantam, and devotees are not allowed for darsan during thesr services. Sahasranama Archana is an arjita seva on Tuesday, Wednesday and thursday and on Friday, Saturday Sunday and Monday it is performed in ekantam. This is very good post and discussion. I do like to seek your advice on are all these Seva done inside the Sanctum? If yes, is there any dress code applicable, any additional measures to be take if i am travelling with my 3 year old kid? If we are going to participate any seva at tirumala, we have to wear traditional dress only, below 12 years children don't require any ticket they can accompany with there parents. Thanks for the info.. Your column was helpful. I did try in Feb but my name was not picked by the Electronic Dip, Now when I click that tab its showing blank. When is it going to open again for me to try my luck? How to book without aadhar or passport? It is not possible to do like that, if any person is not coming that ticket will mear waste. Reast of the people can attend the seva or darshan. Is there an option of getting accommodation with the seva ticket that is picked up in dip.. please suggest.. When is the next slot going to happen ? TTD website says the next date of dip will be updated soon. Next month 1st friday at 10:00am for total Aug 2018 quota will release. I did not get tickets in electronic dip for the month of September . Is there any other option for seva tickets to get ? Hi sir I got tickets for suprabhatham for the month of September. While doing the payment amount is deducted but not got the confirmation. Why iam getting error. Plz reply me n how to confirm my tickets. I too need the similar details, please share your view on this..
Can I apply for Seva Dip & book Kalyanotsavam also at the same time. Our daughter is 14 yrs old, is there any way that all three of us(Me, My wife & daughter) can attend at the same time. It won't effect if the book the seva ticket, as well as the lucky dip. Unmarried girl can come with there parents for kalyanotsavam, provided she have to bring the id proof with traditional dress..
Seva dip we can participate all the people. But who got the ticket in random system, they can alone can go to seva. We can participate for couple ticket in dip system.